Following a sell-out screening in 2015, Talkies Bowes and Bounds brings you a second chance to see this great British independent movie. 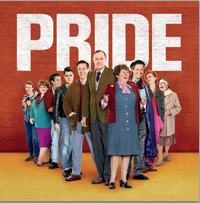 'Pride’ tells the real life inspiring tale of how a group of gay activists in London decided to fundraise for a mining community in South Wales during the miners’ strike of 1984-85. Q&A from Mike Jackson, one of the original LGSM activists.